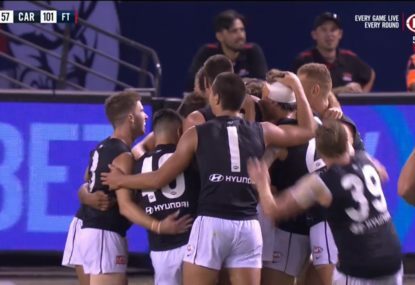 Having bagged Carlton incessantly last season, it gives me genuine pleasure to see (I hope) a brighter future for them in 2019. Let’s start with an observation about playing style. Previous versions of the Blues saw them playing a heavily congested, defensive style of game that wore on the nerves of all involved. A few things lead me to believe this will not be the style that Coach Daniel Harford adopts this season. Firstly, he recruited Amelia Barden from Collingwood. Barden is one plug with which to fill the gaping void in Carlton’s midfield, but more importantly for this train of thought, she’s fast. Barden was excellent in the last half of Collingwood’s 2018, and loved nothing more than to tuck the ball under her arm and run. Then the Blues recruited two cross-code rookies — Chloe Dalton and Brooke Walker, both national reps from rugby sevens. 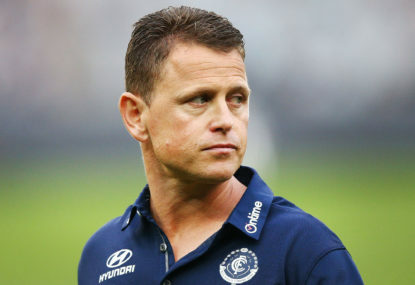 Rugby players sometimes struggle to master AFL skills, but the one thing you can guarantee Dalton and Walker can do is take the game on and run – and so you can see a pattern emerging in Carlton’s recruiting. 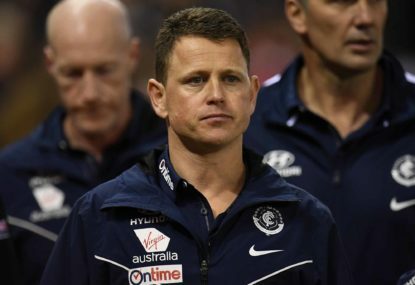 If run-and-gun is what Harford intends for season 2019, there are good reasons to suspect it will work better for Carlton than any other club. 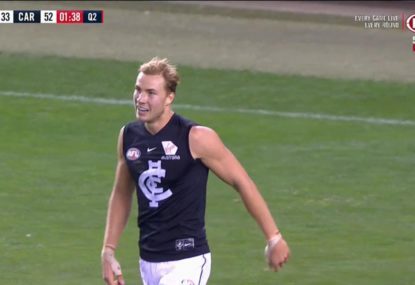 Firstly, Carlton’s rock-solid foundation is their half-back line, assuming it’s healthy. Brianna Davey and Nicola Stevens are two of the best half-backs in the country, and both love to run and hurt their opponents on the counter-attack. Allison Downey is no slouch either, and now the Blues have drafted gun defender Jayde Van Dyk from her VFLW MVP season at Hawthorn (a performance so dominant it dispels my usual concerns about VFLW players hacking it in the pros) and 17-year-old talent Charlotte Wilson from the draft. Not only is this possibly the second-best defensive lineup in the competition (behind Brisbane), but it’s fast and loves to counter-attack. Then consider that up the other end, Carlton have perhaps the two best one-on-one forwards in the league. Darcy Vescio is fresh from single-handedly murdering opposing teams in the VFLW, but has struggled to capture that form in the AFLW. This is mostly because a slow, congested game style leaves her fighting through crowds like a shopper at the mall. The same is true for Tayla Harris, who can beat nearly anyone one-on-one, but has so far rarely had the chance. 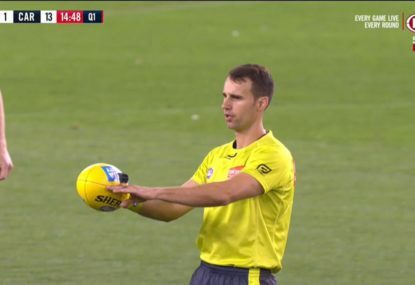 But if the Blues were to adopt a game style of moving the ball as fast as possible in the hopes of catching Vescio and Harris’s opponents one-out, then their forward line could finally show the footballing world what it’s capable of. Gab Pound, too, has improved so much in her first couple of seasons that she’s on the verge of elite status herself — there’s almost no one in the league who is as hard at the ball. But between the explosive backline and the deadly forward line, there’s been the pit of bleak despair in the middle. 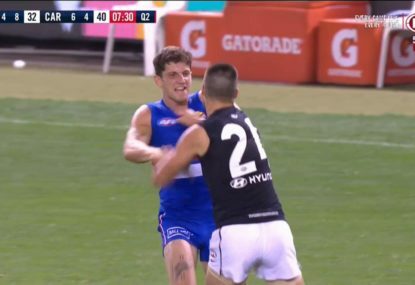 Even there, Carlton have had numerous solid B-grade players, but B-graders against the league’s A-graders is never a winning proposition, with the result generally ending in slaughter. But now from the heavens, amid a blast of trumpets, comes Maddison Prespakis to lead the Blues to the promised land. Yes, this might be overstating things slightly… but then again, she really is that good. Prespakis is not incredibly fast, nor particularly tall, but she is a ball-winning, stoppage-crushing machine — think a young, female Diesel Williams. 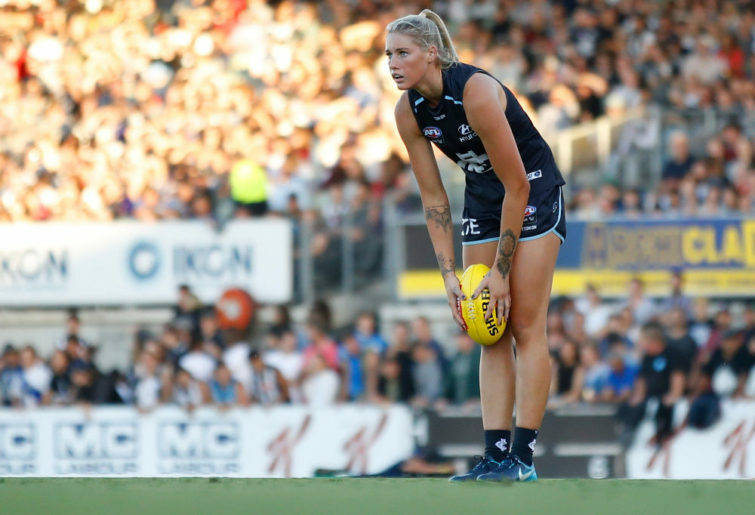 With her in the team, Carlton can expect to win a sizeable number of stoppages they’d otherwise have lost, and find teammates hit with perfect passes from the thick of the congestion. At her side will be second-round pick Abbie McKay (daughter of Andrew, if you’ve been living under a rock with gum in your ears) who is smart and skilful and will also have immediate impact, and possibly one of the draft’s steals in Emerson Woods, whose skills might need a little work but was fastest in the draft combine over the 20 meters sprint. All up it might not be the best midfield in the league, but it’s very competitive and it’s even deep, with Jess and Sarah Hosking providing fast, nimble support, and enforcer Katie Loynes adding some physical pain for opponents at the stoppages. Add it all together, and Carlton’s 2019 lineup looks to have what no other team in the league have save for the Bulldogs — a great balance across all parts of the field. If they make the Grand Final, not only will they make thousands of Carlton fans very happy, but AFL HQ as well.